Take your career to the next level with a Master of Business Administration degree from our nationally recognized program. We offer the advanced education and competitive edge to help you stand out in today’s global economy. 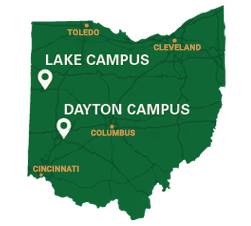 We have a strong academic program at one of the lowest tuition rates in Ohio with multiple flexible scheduling options to fit your life. Learn more about our unique values: quality, flexibility, and affordability. All foundation and core classes are offered online every semester, and three of the concentration courses are offered online each term. You can take courses either on a part-time or full-time schedule. You can take your classes on campus, online, or build a hybrid schedule—a mix of face-to-face and online classes to fit your objectives. View program information and all degree requirements. Tasha Fox has taken study abroad trips to Belgium, Tanzania, China, France and Israel. Graduate student Dubem Obianagha came to Wright State from the African nation of Nigeria to pursue a dream of becoming a doctor.